A SSH connection can be established using a password -the password of the user's account on the SSH host-. This is the basic setting, and it requires the user to enter the password on each access. A more convenient approach can be achieved using SSH keys. Basically, a SSH key is generated, that includes in fact a pair of cryptographic keys -a public encryption key and a private decryption key. The public one is transferred to any host where a SSH session is required. The private one remains on the client machine or machines, and the user should ensure its security. If correctly setup, the user can now access all the servers without introducing any passwords. Definitely very convenient. To have, on each account supporting a SSH connection, a ~/.ssh folder that must be chmod 700: that is, only accessible by the account's owner. To store on this folder the SSH key, named id_rsa (will be named id_dsa if the SSH key's type is DSA). Furthermore, this file must be chmod 600: that is, only accessible by the account's owner. achieves these requirements, producing a 4096 bits RSA key: it creates by default the file ~/.ssh/id_rsa with the right permissions, and, if missing, it creates also the ~/.ssh folder, chmodded to 700. When this command is executed, the user is prompted to enter a passphrase: although is not mandatory to introduce one, it is sensible to have one in most cases. In fact, the ssh-keygen creates two files: ~/.ssh/id_rsa, the private key, and ~/.ssh/id_rsa.pub, that is the public key. This public key can be sent to as many hosts as required -no security concerns here-. To store on this folder a file called authorized_keys, also chmod 600. This file contains each accepted public key, one per line. The format of this file allows to specify options associated to each key, to restrict the associated SSH connection or to perform specific actions when the connection is established. If you still have no SSH key, create one -using ssh-keygen-, and store the private key as ~/.ssh/id_rsa on the client machine or machines. Ensure that the permissions are correct: chmod 700 on the ~/.ssh folder, and chmod 600 on the folder's files. 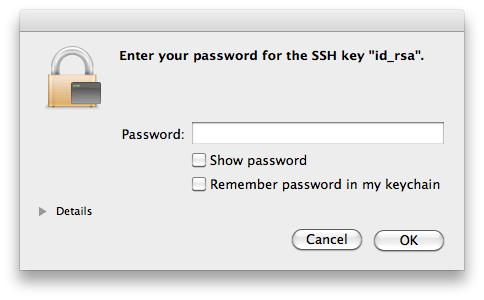 So, the first time the SSH access is required, the Keychain mechanisms in Os X will kick in, presenting that dialog. If the password is added to the keychain, it will not be requested any longer: objective achieved. Adds the private key to the keyring, asking for the passphrase if the key has one. This command requires to have the ssh-agent running -and the environment variable SSH_AUTH_SOCK correctly setup, but this will normally be the case (otherwise, starting ssh-agent automatically displays the required environment variables to set). It is also possible to add the keys to the ssh-agent automatically on each session, just by adding to your ~/.xsession file the line ssh-add, although this requires to have the ssh-askpass package installed. So, to be able to so SSH connections without entering each time a password, it is needed to use SSH keys. And to use SSH keys without entering a passphrase, it is needed to use the ssh-agent (or Keychain in OsX). And the result is not only a higher convenience, but an increased security. Quoting from this weblog entry: when you authenticate to a text-based channel on a remote server, you should never have to type anything about that authentication into the channel that will eventually be controlled by the remote server. Of course, the security is only increased if some conditions are met: once the keyring is accessible, anybody with access to the login session can reach the SSH servers without entering any passwords or passphrase. For example, a laptop with sensible SSH login keys should remain always secure -blocking sessions on standby, or after some idle time-. In principle, there is need for one single SSH key. But although it is overkilling having multiple keys for multiple services or hosts, like, for example, one for each subversion or git repository's server, there are still many scenarios where having multiple keys is the most sensible action. One such scenario is to configure a SSH key without a passphrase to permit automation of operations over SSH, but most commonly is due to security concerns: a laptop could use a key that has granted access to only a subset of all the services or servers, or with granted access to accounts with lower permissions. export SVN_SSH="ssh -i KEYS_FILE user@host"
Changing the passphrase does not impact the public key, it only changes the private key. So, if there are reasons to believe that the private key is compromised, changing the passphrase is definitely not enough: new keys should be generated, and the existing public key replaced on all related servers. This small tutorial covers only the basic of making a default SSH setup work on Linux or OsX. The very basics. There are related concepts like the known_hosts file, xauth, restricting ssh commands, using different SSH protocol versions, etc, etc, etc.